Last week there was a news. To many people there are so many big news that this business cooperation is really a routine, not deserving serious attention. However this news does symbolize something, automation comes deeper into oil and gas industry. Last week, Schlumberger, the biggest service company in the world, and Rockwell, a giant in automation technology, came into an agreement to make a joint venture, sensia, to combine advantages of both company and bring revolutionary solutions to the oil and gas industry. This is the trend. The now joint venture want to release the huge potential of automation in oil and gas industry. Automation has been widely used in many other industry sectors, such as iron and steel industry, for the control of complex machinery. Many advance technologies such as DCS and SCADA are a backbone of many highly complex process control. One good example is the control of steel pipe straighterner, which make steel pipe straight, round, with less hook end. This is a very advance control technique, which uses wavelet theory to control the accuracy of straightener wheels. This is the accuracy of half millimeter with tens of pressing force on straightener with response speed of micro seconds as the steel pipe is going through the machine at 1m/s speed. In the oil and gas industry automation technology has been primarily focused on automated operation of remote oil and gas fields, monitoring long distance pipelines , and data collection. This is just the basic application of automation technology, they have no comparison with automation technologies used in other industry sectors such as iron and steel industry. In solids control technology, there is not much application of automation. However GN Solids Control has been making effort to use automation technology in its products, such as decanter centrifuges. Now GN Solids Control is controlling is decanter centrifuges and monitor their operation parameters with HMI. GN Solids Control is also working on more advanced control technology, such as interlock logics to protect the centrifuges, smart control of differential speed for optimized separation of fed solutions, etc. Application of automation in solids control equipment has tremendous potential to enhance equipment performance, explore new territories unthinkable ever before, and make great revolution come true. One big potential of the marriage of automation with solids control equipment is smart shaker screen. Shaker screens being used in solids control are all “passive” screens because they never play an active role in solids control. They do not know, and there is no way for them to know the condition of incoming fluids, its solids contents, and allowed operation parameters. They simply rock, and rock. With smart shake screen, this situation will be changed completely one day. Smart screen execute command from controller, which collect all the information throughout the drilling process, to determine the optimum operating parameters of smart shaker screens. Smart screen is a power shaker screen. Biggest disadvantage of such structure is its g-force. Usually G force generated is about 6-7, with very high quality and high strength basket being able to generate 8-8.5G force. There is not much room for G force to increase in such structure to increase, limited by the strength of steel frame. However the G force of smart screen can generate unbelievable G force, up to 50G. This is 6 times the G force of best shale shaker. And the G force is applied on the screen, not on the basket. There is no need for super-strong steel for the basket. The secret is the structure of the smart screen. Underneath the smart screen there is an array of excitors, arranged in a pre-determined position. Each excitor will rock at electrical signal. There are tens of such excitors under the smart screen. 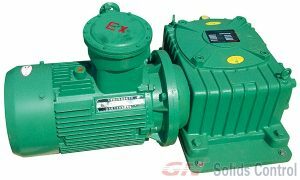 With changing timing and strength of electrical signal, the intensity and frequency can be adjusted, to generate right G force for the coming sludge. For instance, G force will be gentle if solids concentration is low, or majority of solids in the sludge are fine particle. If solids concentration is high, or big particle are the majority of solids phase, G force needs to be bigger. Obviously, two conditions are needed. One is the control of excitors. With complex algorithm, different G force and be generated, or even different G force are generated for different parts of the smart screen. The other is the sensing of particle break-down of incoming sludge. Without automation technology, all these stories will remain stories. Smart screens sound attractive, yet it is very difficult to make them come true. You have to have a mathematical model, on which you get theoretical solutions to have resonance, and to what magnitude this resonance can be, and what parameters are to be adjusted to tune the intensity of G force. After all these, a simulation model needs to be established to “run”, to verify the viability of the model, any deficiencies need to be addressed and corrected. Then it comes to the prototype. First you have to make the excitors identical. This is not supposed to be a manufacturing challenge as technology today make mass production of such excitors with high consistency possible. Then the fabrication technology to make mounting the excitors reliably, and wiring them properly, for the very tough operation conditions they are going to face. The next challenge is the bias effect of many factors resulting from manufacturing and fabrication process. Some of them many have big impact on the resonance of the excitors. Smart screen appears to be a very promising products, it needs to go through a long way before it become mature. GN Solids Control horizontal screw centrifuge is used for alumina dehydration treatment on site. The horizontal screw centrifuge has achieved good results through on-site processing. On-site customers have given positive evaluation and high recognition. GN Solids Control special centrifuge technology service The team assembled and commissioned the service on the spot. The professionalism and excellent technical support of our after-sales service personnel impressed the customers and achieved very good results in the dehydration treatment of alumina. The concentration of alumina sludge before treatment in the on-site use of the horizontal screw centrifuge produced by GN Solids Control is between 8% and 10%. The on-site customer requires the sludge concentration after dewatering to reach 60% to 80%. Containing alumina (fine particle) water and sodium nitrate dissolved in water, Guanneng’s decanter centrifuge can meet the customer’s alumina sludge dewatering requirements. According to the customer’s processing requirements, we can choose different sizes of snail centrifuge. machine. The various types of horizontal screw centrifuges produced by GN Solids Control are mainly used for recovering barite, separating sewage, separating fine solids, reducing the solid content of materials, effectively controlling the density and viscosity of on-site drilling fluid, and ensuring customer drilling fluid. Performance. The straight section and the taper section of the horizontal screw centrifuge are made of 2304 bidirectional stainless steel and are cast by centrifugation. The rest of the drum assembly is made of SS304 stainless steel. The centrifuge auger is protected by wear-resistant alloy sheet for easy maintenance and replacement. . The centrifuge bearing adopts the original imported SKF bearing to improve the stability of the equipment and the service life of the bearing. The design team of Guanneng Centrifuge has accumulated a lot of practical experience in the field, and developed a batch of multi-purpose, which can adapt to various environments and different specifications. High-speed, medium-speed, low-speed and variable frequency centrifuge products have been well received by customers after being put on the market. GN Solids Control is one of the largest solids control and waste management companies specializing in the production of related equipment such as shale shakers, desanders, desilters, mud cleaners, vacuum degassers, mud gas separators, sedimentation centrifuges Machine, agitator, centrifugal pump, cutting dryer, screw pump, shear pump, mud gun, etc. 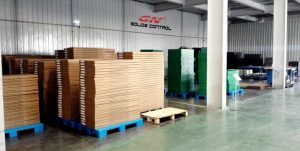 After 10 years of development, GN has promoted its products to more than 60 countries and now has two overseas subsidiaries in the US and Russia. 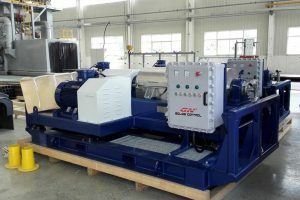 The oil sludge treatment system recently produced by GN Soilds Control is used in Kazakhstan for the convenience of the overall transportation of the oily sludge treatment system. The on-site installation and the formal operation have been highly recognized by the customers in Kazakhstan, and have been debugged by the after-sales service personnel of GN Soilds Control. In the case of feedback on the use of field equipment, the effect of the oily sludge treatment system has exceeded the original design expectations. Kazakhstan customers are highly appreciative. The high oil content of the on-site waste of Kazakhstan customers cannot be directly used or effluxed, and it is piled up to be air-dried or buried underground. It not only pollutes the environment, but also causes a lot of waste of resources. The local environmental protection department lists oily sludge as dangerous solid waste. The company’s oily sludge treatment system not only improves the environment, but also recovers crude oil and achieves considerable economic benefits. 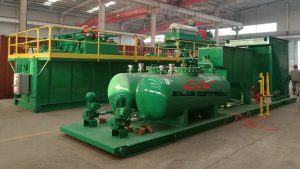 The oily sludge treatment system produced by GN Soilds Control mainly consists of sludge vacuum pump, tank body, dosing system, heating mixing tank, buffer oil water separation tank, vibrating screen, horizontal screw centrifuge, three-phase disc machine, screw pump, PE. The tank, the receiving box and the like, the oil sludge first enters the heating and stirring tank and simultaneously adds the flocculating agent, and is separated by the vibrating and sieving, the horizontal screw centrifuge is solid-liquid separation, and the three-phase disc machine separates the oil, water and mud. The solid phase oil content after treatment is controlled at ≤ 2% to meet customer’s processing requirements.